There’s no limit to innovative expression when you bring together AAA batteries, microprocessors, and the vivid imaginations from Lafayette electrical and computer engineering majors. Five teams of students studying Embedded Systems with Jon Wallace, associate professor of electrical and computer engineering, produced a creative array of projects, each with the potential for commercial applications, working with $70 budgets. Here’s a look at what came out of the labs on the fourth floor of Acopian Engineering Center in just seven weeks. 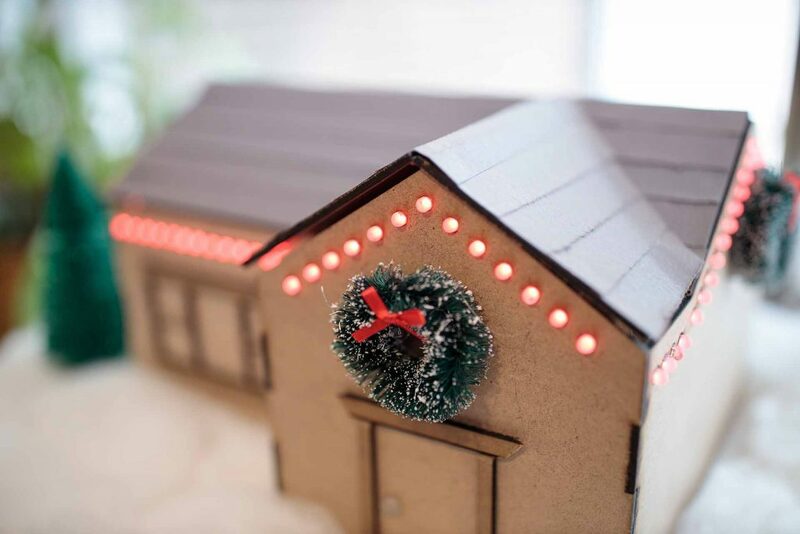 Katie Lee ’19, Simone Khalifa ’20, and Leah Diamantides ’20 designed a scale model of an exterior LED display for the home controlled by a touch screen. With a touch of a finger, it allows a homeowner to control outdoor decorative lighting schemes to match the season. Lights can be configured to flash in different sequences and display different colors. 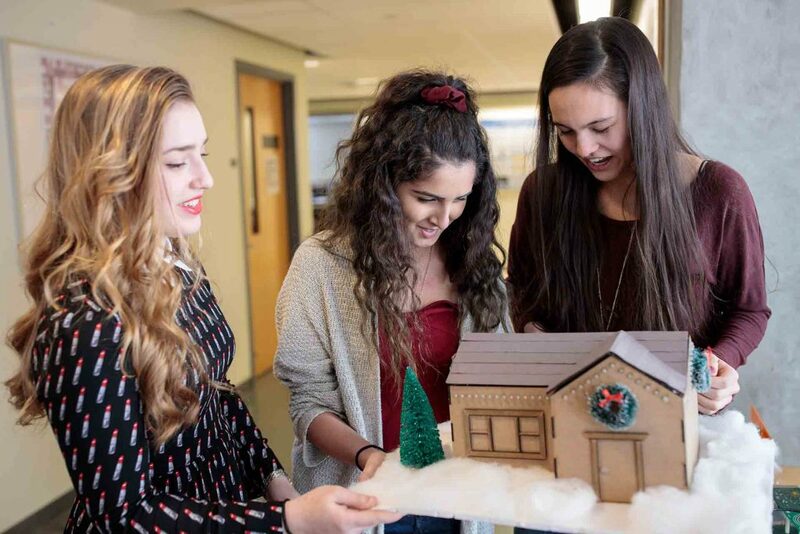 Their miniature house, with its evergreen landscaping, is studded with lights below the roofline and glows with dazzling color as the students manipulate different patterns from the touch screen. There are a lot of outdoor lighting systems on the market, but they can be expensive and difficult to operate. Seniors Hongbo Du ’19, Yuqiu Zang, and Zian Geng ’19 embarked on what was probably the most ambitious and complex project by developing a system that would allow them to use custom software to accomplish a variety of drone flight missions. The basic hardware system is not much different from a standard drone, but it required them to program and connect many different components together, including the sensors, motor speed management, balance control, and navigation. They also developed a smartphone interface that allowed the drone to be manually controlled, tested the system, and managed a couple successful flights. Because the students needed powerful motors and batteries for their drone, the project went over budget. While the rules specified a $70 budget, students are allowed to invest their own money for their projects. Every baker knows the critical importance of the right proportions of sugar, flour, salt, and baking soda. If the ingredients are off even just a little, a cake or loaf of bread will fall flat, dry out, or crumble before your eyes. 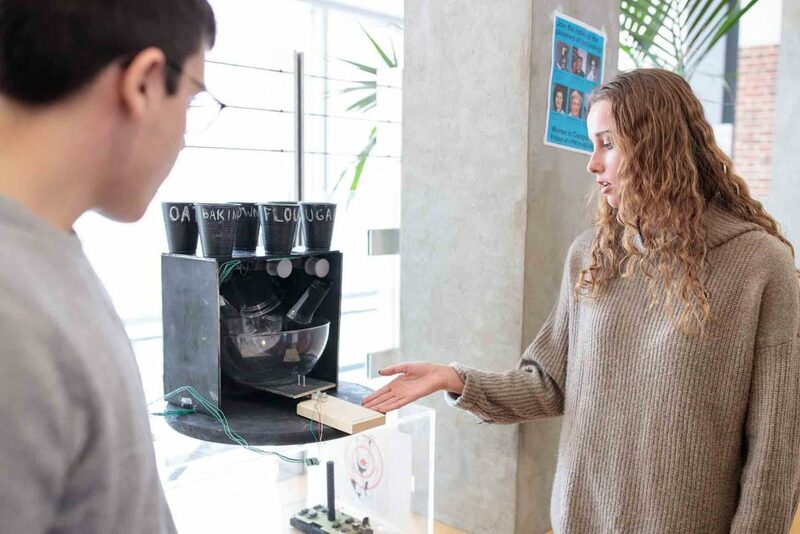 Electrical and computer engineering majors Jordyn Brosemer ’20 and Maureen McShane ’20 built a device, dubbed the “Baking Buddy,” that ensures baking perfection by using a computer to dispense exact amounts of required ingredients for any given recipe. The computer interface controls a series of rotating canisters that release various ingredients into a bowl below. Brosemer and McShane believe their prototype might have applications for large-scale commercial bakeries. Someday not too far into the future, a robot may be taking your food order at a restaurant and preparing it in the kitchen. Tasks like cracking an egg, which requires human dexterity, will be among the many job requirements for a food-service robot. 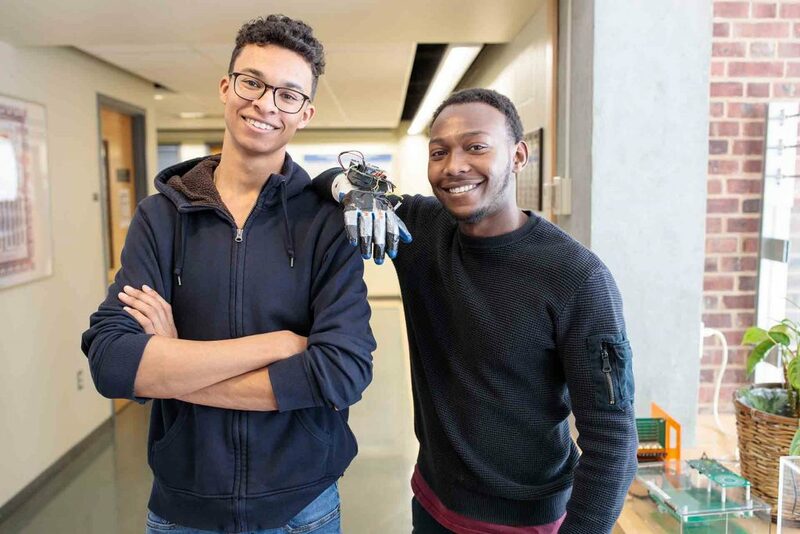 Max McFarlane ’19 and Samuel Mwaura ’19 set out to capture and record human hand movements using a glove embedded with sensors. 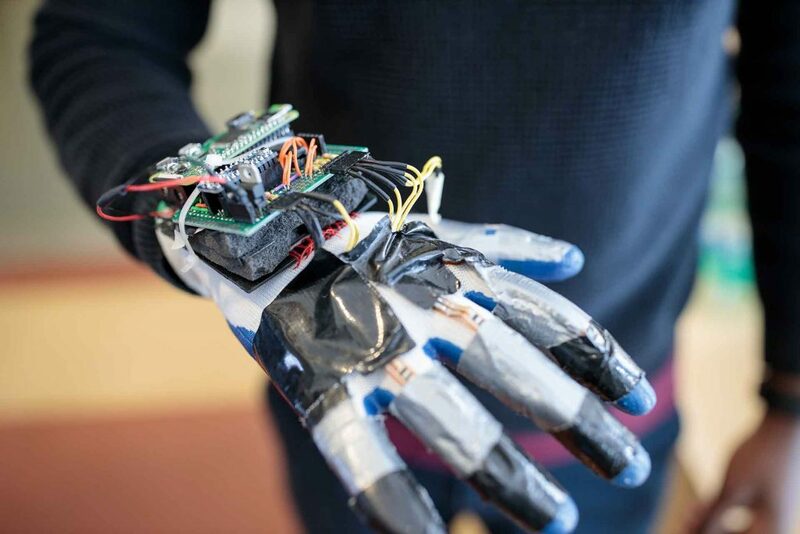 Intricate movements of finger joints are captured to inform a robotic device to carry out tasks that require tactile precision. McFarlane sees other uses for the device beyond food service, including robotic sign language interpretation or even surgical procedures that would be performed remotely. From the moment they heard the project description, Alex Kmetz ’19 and Drew Carleton ’19 knew they wanted to build something fun. 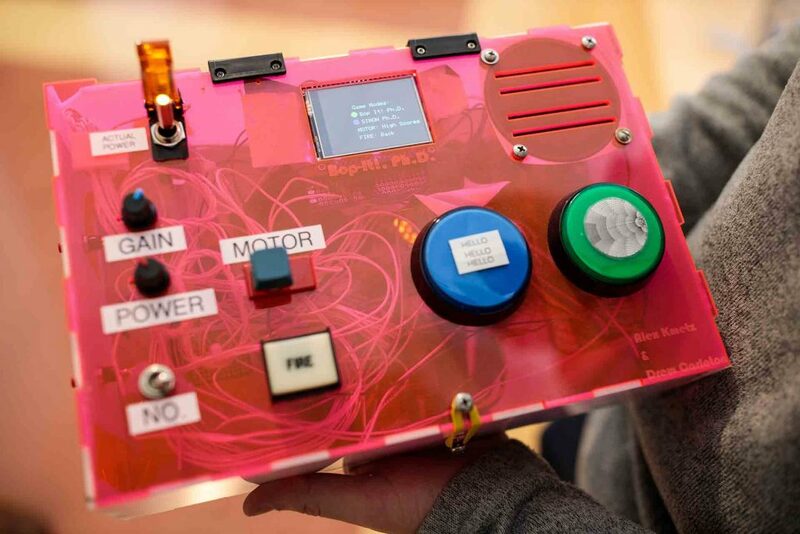 Their creation, housed in a custom-made acrylic box, expanded on the popular audio-based game by involving synthesized commands from faculty across the electrical and computer engineering department. Prof. Ismail Jouny’s rapid-fire “hello, hello, hello” is among Kmetz’s favorite buttons to press. Outstanding ideas coming to life. Very impressive.